Torrential downpours flooded the Schuylkill Expressway’s westbound lane near King of Prussia on Monday morning, trapping some trucks in its currents and rendering the road impassable, according to KYW Traffic. Additional flooding is being reported as heavy rain continues to slam the region. According to NBC10, there had been at least a dozen vehicle rescues on highways across Chester, Montgomery and Delaware Counties as of 10:30 a.m.
As of 11:30 a.m., the Pennsylvania Turnpike was closed between Valley Forge and Norristown, according to the Montgomery County Department of Public Safety. Given intense storms over the weekend, the ground in many areas is already saturated, meaning additional rain causes floods to appear quicker. Heavy rain is expected through Tuesday. But if unbelievable videos are a reliable metric, New Jersey has fared even worse than Pennsylvania over the last few days. 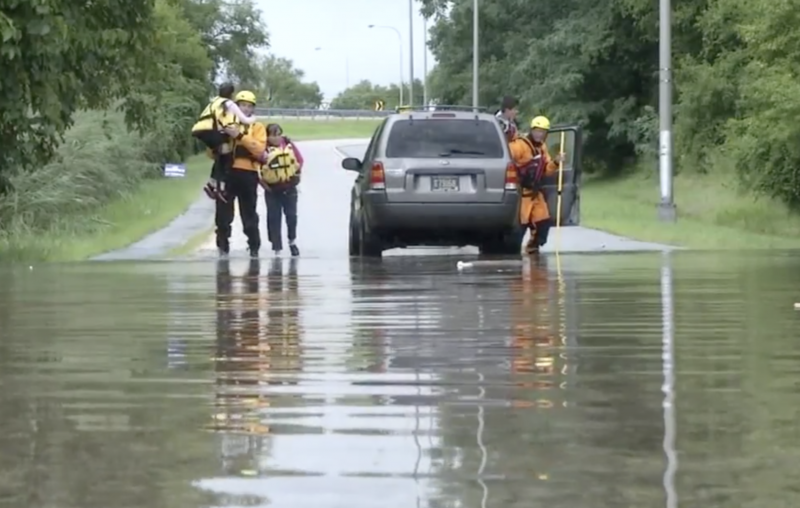 A bride and groom had to be rescued from their car on Saturday in Bergen. And a Little Falls car dealership watched as cars were lifted off the lot and floated down the street by onrushing water. Philadelphia International Airport is urging fliers to double-check that their flights haven’t been delayed before venturing out.